Our vegetable garden was on its last leg this week, so we decided to pull everything out and say goodbye to Timmy the Tomato and Zach the Zucchini. 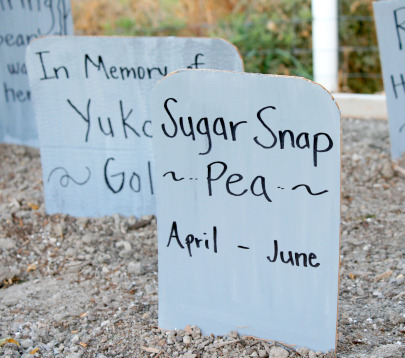 We crafted some tombstones to remember them by, laying to rest our sweet vegetable garden. Plus the timing is perfect for Halloween. 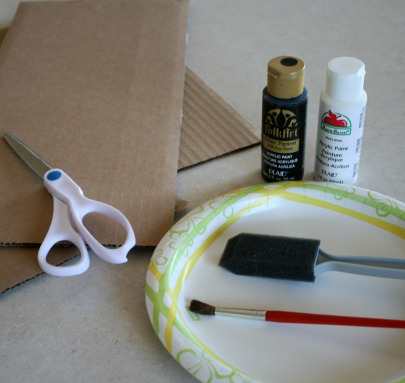 First, cut your cardboard pieces to look like tombstones. They can be tall and skinny or short and fat. My stones are a few different sizes. These are about 2 feet high and 1 foot wide. 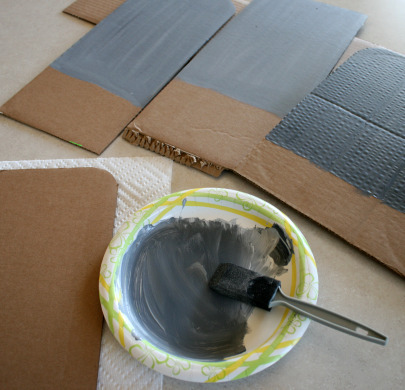 Using the sponge brush, paint each cardboard piece with the gray paint. You don’t need to paint the bottom 3-4 inches, as that section will be stuck in the ground. 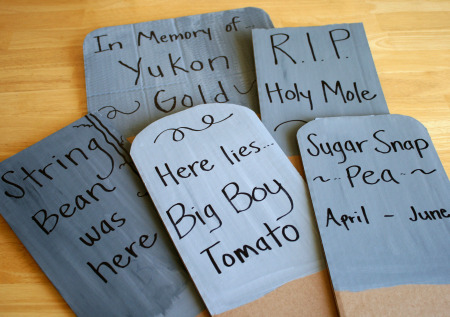 With your black marker, or paint, write the name of the vegetable on the tombstone. 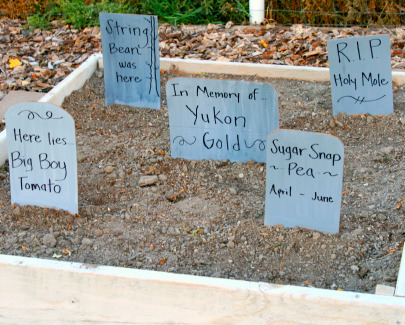 We had potatoes, snap peas, string beans, tomatoes, and Holy Mole peppers. I gave them silly names and added words like: RIP or Here lies or In Memory of. Now stick them in your garden where your vegetables used to grow! You could even say a short speech about how they helped provide for you and how great the zucchini bread you made turned out. Farewell you delicious bounty, rest in peace! Cute idea, decent decorations with a very minimal cost! My mom was very crafty and made stuff as simple as this and way more extravagant things too, but there were more reusable since they were made of wood. But for people like me who haven’t an arsenal of saws and other stuff like that, the cardboard and scissors are just the ticket.